To whom do I write the thank you card? As tough as things have been for most of us these past few years (we’re definitely included in this), I feel that I have so much for which to be grateful this Thanksgiving and now just need to know to whom I write the thank you card? Between finally getting out of dreary and “frosty” Seattle, thanks to Keith (my incredibly creative and talented husband) landing an amazing opportunity at what we’re pretty certain is his dream interactive agency in San Francisco, and a healthy and happy enough circle of family and friends, I thought I had been blessed enough. However, by seriously shaking things up in our lives and shifting the energy around this year, it appears the universe is now directing some of that famous California sunshine on the many seeds I’ve planted these past few years. So, why do I want to share some of what I have to be grateful for today? Well, beside it being Thanksgiving, and simply wanting to share my excitement over recent events, I think it is worth explaining that the type of content creation, publicity and media exposure I share below demonstrates what I can also do for my clients. It took plenty of hard, smart and efficient work, and a little bit of good fortune, but it was mainly strategy, tactics and persistent follow-up that made most of what I share below happen. Some of the most significant sprouting is around my writing and content creation in the form of the little seedling that is my book, “I’m at a Networking Event–Now What?? ?” I’d say this little sprout is well on its way to becoming a nice sturdy plant and I have my incredible network of friends, family, contacts, colleagues and fans for helping me get the word out and consistently supporting my efforts in promoting my networking manifesto. Plus, doing a few 12 Rules of Effective Networking webinars for some non-profits has brought me more good karma than I ever could have imagined and has enabled me to reach way more people than the number of folks that have attended my PIF (pay it forward) Parties to date. I’ve seen the direct correlation between those webinars and the opportunities that have recently come my way, as well as the new Facebook fans, Twitter followers, Bella Domain Networking group members on LinkedIn, email/blog subscribers and more. Earlier this year, I was also fortunate enough to get selected as a columnist for WomenEntrepreneur.com where recently my third article for my Networking is Connecting column was recently picked up by FoxNews.com (of all places). Then, within a few days of that happening, and thanks to a Google alert, I found out that my book was in the #1 spot on the Inc.com 2010 Holiday Gift Guide for business books! Whah?? Such a gift! And with any luck, I’ll soon get to break-even with my publisher, Mitchell Levy of Happy About! Lastly, after spotting the Inc.com recognition, and a few days of jumping up and down with excitement, yesterday, I learned (thanks to another Google alert) that, most likely due to all the activity around these things, I was the featured columnist on the WomenEntrepreneur.com home page (see below)! Sweet! Now, to whom do you think I should write the thank you card?? Kind of a hard call isn’t it? 😉 Happy Thanksgiving all and please let me know if there is anything I can help YOU be thankful for by next Turkey Day! Comments : Comments Off on To whom do I write the thank you card? What a great experience I had in Denver last week while co-presenting (along with SMPS board member, Stan Wagner) to the Denver chapter of the SMPS during a 3 hour workshop on the importance networking plays in truly effective business development. We used quite a bit of content from my book, and also incorporated plenty of new information and tactics for this knowledgeable and sophisticated group. C. Where do you use it? in the Mile High City where workshop attendees and other SMPS members connected and networked by learning what each was currently working on and the things they needed help with right now. You can read more about the event HERE, and as soon as we receive our session feedback forms, I’ll hopefully be able to share some great feedback here as well. I’m looking forward to doing more of these for other SMPS chapters and various other professional associations across the country. Please contact me directly if you’d like to discuss your upcoming event or feel free to share this blog post with others you think might be interested in inviting me to present to their group. You can just click HERE to email me and/or request a copy of my speakers packet. It’s time to take Bella Domain’s PIF Party concept on the road and the first out-of-state party will be in San Francisco on Thursday, February 11, 2010 at Roe on Howard over near Mission and 3rd. Yes, considering I lived there for almost 5 years not too long ago, and still love that town, how could it not be my first choice?! You can or go to our PIF Parties page to learn more. Please help us spread the word about this event, and, as always, thanks for supporting the pay it forward way! Happy New Year! And, just in time for Valentine’s Day, I wanted to share that I’ll be in the Bay Area again for this book related event on Wed, 2/10/2010 (cool date, eh? ), and then another book/Pay It Forward/Valentine’s themed happy hour event in San Fran on Thur, Feb 11. Why not show some luv to your network and try to attend if you’re in the area or maybe consider this an easy “pay it forward” and help spread the word with your peeps in San Fran/Silicon Valley? 🙂 Thanks a bunch and watch for the announcement on the SF location which will be confirmed soon! p.s. If I haven’t spammed you about my book yet, here’s the link on Amazon. Check out the video we just got up on YouTube and please share it w/your peeps! Thanks to Keith, Geoff, Marc, Kendra, Julia and Karin for the great giggle (watch – you’ll see). My first Black Friday ad? Comments : Comments Off on My first Black Friday ad? Way to Pay It Forward People! What a way to Pay It Forward people! Over 80 positive karma creators showed up at The Local Vine Thursday night to contribute to the network effect created when a group of well-intentioned people gather to create some good karma and actually offer help to each other first. I owe some serious gratitude to Karin Zabel, the new head of the networking team at the PSAMA (she took over for me in Aug), for being the brain child behind combing the forces of PIF Parties with the reach of the Seattle-area American Marketing Association. Thanks again Karin! I’ll definitely be on the lookout for other opportunities to co-host similar PIF-style events during the months to come. 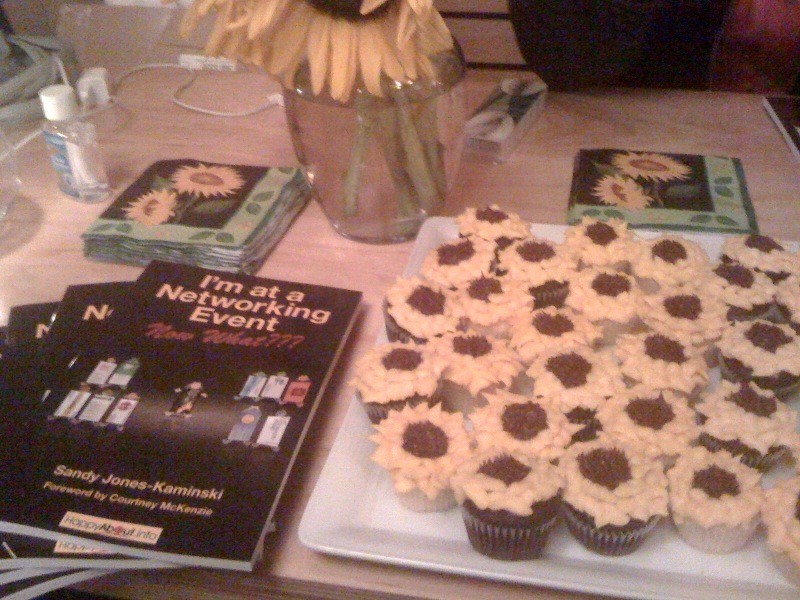 And, while we did manage to sell a few copies of my new book (I’m at a Networking Event–Now What??? ), the real “win” of the evening was hearing the constant hum of the group learning what other people were working on and what kind of help they needed right now. Note: Your email address will not be shared nor distributed. Order Your Copy of I’m at a Networking Event–Now What??? Click image to buy "I'm at a Networking Event--Now What???" on Amazon today. Paperback or Kindle. CLICK HERE to download our Media Kit. CLICK HERE to download Speaker info. Download the publisher's press release HERE. Download a sample chapter of our book HERE. What do you want to shelve in 2012? Thanks for visiting and please come back again and often. Unless otherwise specified, all content is made available under the Creative Commons License found HERE. You are most welcome here!